Not to be confused with Laptop, a microcomputer of any portability for consumer use. 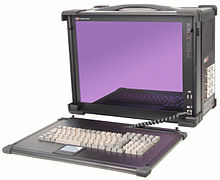 A portable computer was a computer designed to be easily moved from one place to another and included a display and keyboard. The first commercially sold portable was the 50 pound IBM 5100, introduced 1975. 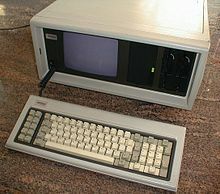 The next major portables were Osborne's 24 pound CP/M-based Osborne 1 (1981) and Compaq's 28 pound 100% IBM PC compatible Compaq Portable (1983). These "luggable" computers lacked the next technological development, not requiring an external power source; that feature was introduced by the laptop. Laptops were followed by lighter models, so that in the 2000s mobile devices and by 2007 smartphones made the term almost meaningless. The 2010s introduced wearable computers such as smartwatches. Portable computers, by their nature, were generally microcomputers. 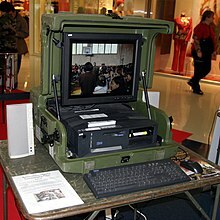 Larger portable computers were commonly known as 'Lunchbox' or 'Luggable' computers. They were also called a 'Portable Workstation' or 'Portable PC'. In Japan they were often called 'Bentocom'. (ベントコン, Bentokon) from "bento". Portable computers, more narrowly defined, were distinct from desktop replacement computers in that they usually were constructed from full-specification desktop components, and did not incorporate features associated with laptops or mobile devices. A portable computer in this usage, versus a laptop or other mobile computing device, had a standard motherboard or backplane providing plug-in slots for add-in cards. This allowed mission specific cards such as test, A/D, or communication protocol (IEEE-488, 1553) to be installed. Portable computers also provided for more disk storage by using standard disk drives and providing for multiple drives. In 1973, the IBM Palo Alto Scientific Center developed a portable computer prototype called SCAMP (Special Computer APL Machine Portable) based on the IBM PALM processor with a Philips compact cassette drive, small CRT and full function keyboard. SCAMP emulated an IBM 1130 minicomputer in order to run APL\1130. In 1973, APL was generally available only on mainframe computers, and most desktop sized microcomputers such as the Wang 2200 or HP 9800 offered only BASIC. Because SCAMP was the first to emulate APL\1130 performance on a portable, single user computer, PC Magazine in 1983 designated SCAMP a "revolutionary concept" and "the world's first personal computer". Successful demonstrations of the 1973 SCAMP prototype led to the first commercial IBM 5100 portable microcomputer launched in 1975. The product incorporated an IBM PALM processor, 5 inch CRT, full function keyboard and the ability to be programmed in both APL and BASIC for engineers, analysts, statisticians and other business problem-solvers. (IBM provided different models of the 5100 supporting only BASIC, only APL, or both selectable by a physical switch on the front panel.) IBM referred to its PALM processor as a microprocessor, though they used that term to mean a processor that executes microcode to implement a higher-level instruction set, rather than its conventional definition of a complete processor on a single silicon integrated circuit; the PALM processor was a large circuit board populated with over a dozen chips. In the late 1960s, such a machine would have been nearly as large as two desks and would have weighed about half a ton. In comparison, the IBM 5100 weighed about 53 pounds (24 kg and very portable for that time). The MIT Suitcase Computer, constructed in 1975, was the first known microprocessor-based portable computer. It was based on the Motorola 6800. Constructed in a Samsonite suitcase approximately 20"x30"x8" and weighing approximately 20 lbs., it had 4K of SRAM, a serial port to accept downloaded software and connect to a modem, a keyboard and a 40-column thermal printer taken from a cash register. Built by student David Emberson in the MIT Digital Systems Laboratory as a thesis project, it never entered production. It is currently in the collection of Dr. Hoo-Min D. Toong. Xerox NoteTaker, developed in 1976 at Xerox PARC, was a precursor to later portable computers from Osborne Computer Corporation and Compaq, though it remained a prototype and did not enter production. An early portable computer was manufactured in 1979 by GM Research, a small company in Santa Monica, California. The machine which was designed and patented by James Murez. It was called the Micro Star and later changed the name to The Small One. Although Xerox claims to have designed the first such system, the machine by Murez predated anything on the market or that had been documented in any publication at the time – hence the patent was issued. As early as 1979, the U.S. Government was contracting to purchase these machines. Other major customers included Sandia Labs, General Dynamics, BBN (featured on the cover of their annual report in 1980 as the C.A.T. system) and several dozen private individuals and companies around the world. In 1979, Adam Osborne viewed the machine along with several hundred other visitors at the first computer show that was sponsored by the IEEE Westec in Los Angeles. Later that year the machine was also shown at the first COMDEX show. The portable micro computer the "Portal" of the French company R2E Micral CCMC officially appeared in September 1980 at the Sicob show in Paris. The Portal was a portable microcomputer designed and marketed by the studies and developments department of the French firm R2E Micral in 1980 at the request of the company CCMC specializing in payroll and accounting. The Portal was based on an intel 8085 processor, 8-bit, clocked at 2 MHz. It was equipped with a central 64 KB RAM, a keyboard with 58 alpha numeric keys and 11 numeric keys (separate blocks), a 32-character screen, a floppy disk: capacity = 140 000 characters, of a thermal printer: speed = 28 characters / sec, an asynchronous channel, a synchronous channel, a 220 V power supply. Designed for an operating temperature of 15 °C to 35 °C, it weighed 12 kg and its dimensions were 45 × 45 × 15 cm. It provided total mobility. Its operating system was Prolog. A few hundred were sold between 1980 and 1983. The first mass-produced microprocessor-based portable computer released in 1981 was the Osborne 1, developed by Osborne, which owed much to the NoteTaker's design. Another early portable computer released in 1982 was the Kaypro. In January 1983, the first IBM PC compatible portable computer (and the first 100% IBM PC compatible, or "clone," of any kind) was the Compaq Portable. The first full-color portable computer was the Commodore SX-64 in January 1984. Apple Inc. introduced and released Macintosh Portable in 1989. The laptop (or notebook) with a flat panel display and keyboard, requiring a seated position and both hands. A relatively recently introduced modification has been the tablet PC, which has a monitor with a touch-sensitive screen. See also desktop replacement computer, a large laptop designed to perform all of the functions of a desktop computer. The sub-notebook which is something between a laptop and a PDA. They have a full keyboard (though often in reduced size), 11–13" screens and usually no internal optical drive. PDAs, tablet computers and smartphones are more portable, and have even fewer peripherals. The wearable computer with hands-free interface, and usually some voice capability (speech recognition and speech synthesis). Portable computers have been increasing in popularity over the past decade, as they do not restrict the user in terms of mobility as a desktop computer would. Wireless access to the Internet, extended battery life and more comfortable ergonomics have been factors driving this increase in popularity. All-in-One PCs such as the iMac and the original Apple Macintosh can also be considered portable computers and often have handles built into the case. 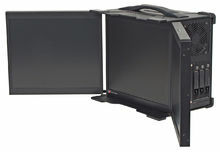 Home theater computers (HTPC) tend to be much smaller than desktop computers, but still require a power source. Wikimedia Commons has media related to Portable computers. ^ as contrasted with DYSEAC and MOBIDIC, 1950s era military systems which were Truck-based/"movable by truck"
^ a b Shanna Freeman. "What was the first portable computer?". ^ "and plug in instead of relying on battery power." ^ Petre, Reza Rawassizadeh, Blaine A Price, Marian. "Wearables: Has the Age of Smartwatches Finally Arrived? | January 2015 | Communications of the ACM". cacm.acm.org. Retrieved 2017-05-05. ^ Name: (2014-05-23). "What is a Portable Computer? | ACME Portable Machines". Acmeportable.com. Retrieved 2014-07-22. ^ Freeman, Shanna (2012-09-19). "HowStuffWorks "What was the first portable computer?"". Computer.howstuffworks.com. Retrieved 2014-07-22. ^ "IBM Archives: IBM 5100 Portable Computer". 03.ibm.com. Retrieved 2014-07-22. ^ This author learned this from an original IBM document for operators of the 5100 but does not recall the title of the document. ^ "Industrial Portable Computers". Advantech. Retrieved 2014-07-22.